I find most modern art is crappy. It takes genuine talent to create giant bronze sculptures of preborn babies. 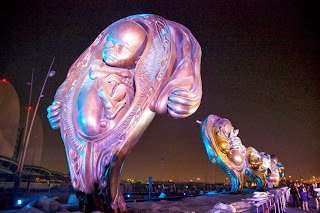 I like how these sculptures underscore the humanity of the unborn. I use a lot of photos and videos in my pro-life activism. But I think a sculpture, while not an exact replica, makes the unborn more tangible. And in that sense, they convey their reality in a way that pixels can't. I really wish the pro-life movement had more artists within its ranks and used art more regularly. One of the concerns I have about using graphic images is that I fear people will get so used to them that their hearts will deaden to the humanity of the unborn. Art is one way to counteract that effect. Because if convey the beauty and the dignity of the unborn child to the general public, it gives power to those graphic images, because the more beautiful the unborn child, the uglier is his desecration. The nice thing about this piece is that it will have lasting power. There have been other paintings and sculptures, but they all have to be seen in a museum. This is a monument. People will be taking pictures of this work for centuries to come.